This turned out so delicious. Moist, tender, and flavorful. I will definitely make it again. I think it would also be great with other types of nuts, like almonds, or maybe an orange-pecan variation. Combine the chopped nuts with the lemon zest. Choose a baking pan that comfortably holds the fish in a single layer. Brush the pan lightly with melted butter. Place the fish in the pan (skin side down, if there is skin) then brush with the remaining melted butter. 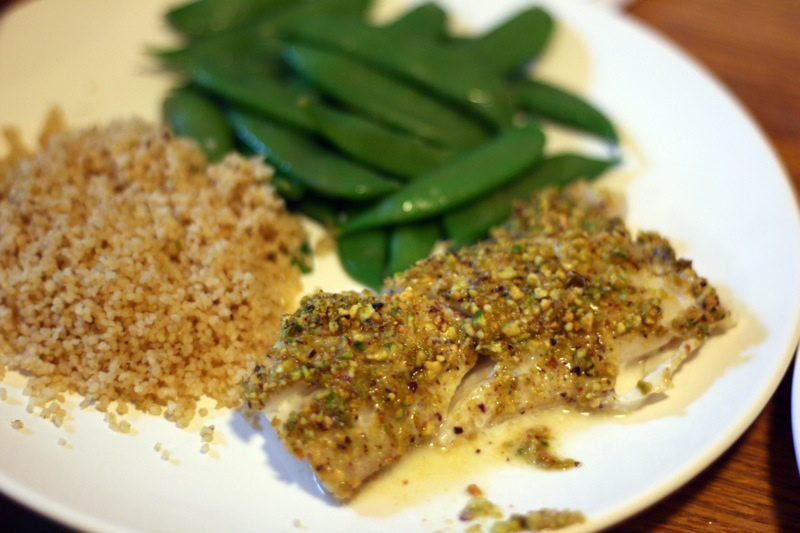 Season with salt and pepper, then coat the fish with the pistachio mixture. Bake about 15 minutes, until the fish is flaky. Remove from oven and squeeze a lemon half over top. Serve immediately.